One of my friends sent out a message today on Facebook to our whole crew of friends about a Macaroni & Cheese cook off that's happening Friday night in downtown Charleston. WHAT?!?! How did I not hear about this until today?!? The gist is that 12 different restaurants are cooking up a ton of their best Mac & Cheese recipes and then the public samples the different selections and votes on their favorite. It's downtown Charleston at the Visitor Center Bus Shed (big, covered outdoor area used for events like Oyster Roasts, etc.) this Friday night, 7pm to 11pm. 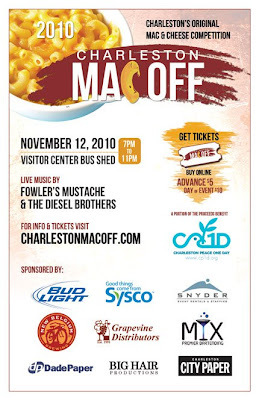 Tickets are only $5 in advance and then you purchase a $1 ticket for each Mac & Cheese sample you want to try. A portion of the proceeds will go to charity. There's going to be live music and drinks...plus all the Mac & Cheese you could eat! What's not to love?!?! Wow, so wish I would be in Charleston this weekend instead of Columbia! oh.my.gosh you know i'm going to have go out and try every kind of mac and cheese there. i could live off of that stuff. sounds like a delicious delicious blast! yum! Yum! I LOVE J'Paulz truffle mac & cheese!